The global financial crisis that began in 2007 was the most destructive since the 1930s. The rapid spread of the crisis across borders and the complexity of these cross-border linkages highlighted the importance for authorities of working together in responding to the crisis. 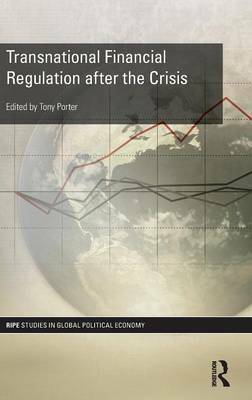 This book examines the transnational response that relied heavily on a set of relatively informal transnational regulatory groupings that had been constructed over previous decades. During the crisis these arrangements were made stronger and more inclusive, but they remain very complex. Thousands of pages of new rules have been created by various transnational bodies, and the implementation of these rules relies heavily on domestic law and regulation and private rules and practices. This book analyses this complex response, showing that its overly technical and incremental character, the persistence of tensions between transnational processes and state-centred politics, and the ongoing power of private actors, have made the regulatory response fall short of what is needed. Transnational Financial Regulation after the Crisis provides new insights that are relevant for theory and practice, not only for transnational financial regulation, but for global governance more generally.